Tom Carrier, our resident vexillologist, has worked tirelessly on the history behind the creation of each version of the American flag as our country grew and states were added. We are thrilled to share his discoveries over the next few weeks. The design of the flag has been officially modified 26 times since 1777. This week we bring you the story behind the 20-Star Flag of the United States. Enjoy! 20-star Flag, 1818, Boleslaw-Mastai Collection. By 1817, five new states had entered the Union: Tennessee (16), Ohio (17), Louisiana (18) Indiana (19), and Mississippi (20) for a total of 20 states. Yet, the official national flag still featured 15 stars and 15 stripes as it was adopted in 1795. Congressman Peter Wendover of New York was tasked with the possibility of altering the national flag design and asked Navy officer Samuel Reid for help with new patterns. Eventually it was decided that the national flag would revert to its original design of 13 alternate red and white stripes to honor the original 13 states. The stars, though, would reflect the number of states in the Union with one star added to the flag on the following July 4th after admission. An Act to establish the flag of the United States. Be it enacted by the Senate and House of Representatives of the United States of America, in Congress Assembled, That from and after the fourth day of July next, the flag of the United States be thirteen horizontal stripes, alternate red and white: that the union be twenty stars, white in a blue field. And be it further enacted, That on the admission of every new state into the Union, one star be added to the union of the flag; and that such addition shall take effect of the fourth day of July then next succeeding such admission. Notice that the pattern of stars, the number of points for each star, and the meaning of the colors of the flag were still not specified. Then on July 4th, 1818, to recognize the additional five states, the 20-star flag became an official flag of the United States. It would remain official until the addition of Illinois as the 21st state later that year. One official 20-star flag (see photo above) was prominently featured in the collection of Boleslaw Mastai, a major historic flag collection, but other similar flags of the 1818 period have yet to be discovered. Between 1795 and 1818, flags may exist that feature star patterns of more than 15, but less than 20 stars. However, it seems that they may have been produced much later since hardly any flags of this period have survived. For example, a 16-star flag had been used as a naval ensign from 1857 to 1861 and would have been constructed of single ply wool bunting similar to the construction of the early 19th century, but the stripes of the naval ensign would have been sewn by machine which became commercially available by 1850. Close up of 20 Star Flag with linen heading with hand stitched open eyelet. Date: The 20-star flag would be dated from 1818 with only one national flag from this particular year to examine. Size: The one flag of this period is measured at 103 inches long by 56 ¾ inches wide. Star Pattern: The usual star pattern for a 20-star flag would be 4 rows of 5 five-pointed stars of cotton and hand-sewn to the blue field (union). Stripes: There are 7 rows of red stripes, 6 rows of white stripes of single-ply wool. 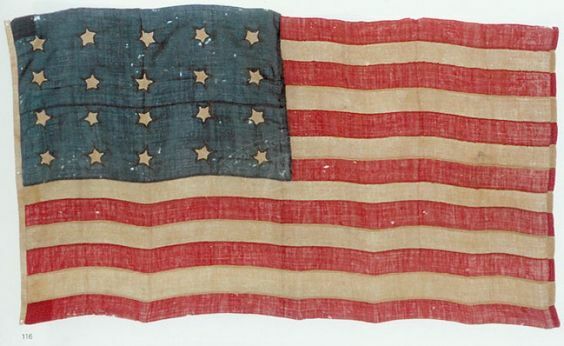 There are no identifying marks or identification for this one surviving 20-star flag. Tom Carrier is a General Worthologist with a specialty in Americana, political memorabilia and he has been the resident WorthPoint vexillologist (flags, seals and heraldry) since 2007. Tom is also a frequent contributor of articles to WorthPoint. The Evolution of Old Glory–How Much Do You Know?